Digha, West Bengal's most popular seaside resort town is just 183 km away from the capital Kolkata. It lies in East Midnapore district and at the northern end of the Bay of Bengal. Renowned for its beaches, Digha is visited by thousands of tourists every year. With season time round the year, It is mostly famous as a weekend destination for Kolkatans. Located at 21°41′N 87°33′E﻿ / ﻿21.68°N 87.55°E﻿ / 21.68; 87.55 and with an average elevation of 6 metres (22 feet), Digha is enriched with casuarinas plantations along the coast enhancing the beauty of this place. These trees apart from beautifying the sands also aid in reducing the erosion on the dunes as the place sufferred a lot of erosion during the years. Digha's old beach isn't as wide as it used to be due to heavy soil erosion. Big stones and concrete steps are used to hold together the beach. Another problem is the record number of tidal waves during rough seasons that have caused many of the unplanned shacks and smaller hotels to succumb to the sea. The place has a low gradient with a shallow sand beach with gentle waves extends 7 kms in length. Both the sunrise and sunset at Digha sea beach are charming. The sunsets and sunrises reflecting off the salty waters of the Bay of Bengal are something straight off an artist's easel. The sea at Digha is calm and shallow for about a mile from the beach making it quite safe for swimming. Digha Originally was known as Beerkul and during Warren Hastings time was discovered in the late 18th century by the British. It is mentioned as the "Brighton of the East" in one of Warren Hasting's letters (1780 AD) to his wife. An English tourist John Frank Smith started living here in 1923 and his writings provided a good exposure to this place. He convinced West Bengal Chief Minister Bidhan Chandra Roy to develop this place to be a beach resort. Digha is well connected to Kolkata/Howrah by a highway and a rail-link via Tamluk. Regular Buses are available from Esplanade and Howrah Station and trains ply from Howrah/Shalimar for 3 times daily. Udaipur: This is a spectacular beach, almost virgin, 2 km west of Digha, in West Bengal Orissa Border. One part of this clandestine beach is in West Bengal and the other in Orissa. One enters this beach just walking or driving along Bengal-Orissa border. This beach has not been explored so far. The beach has some USPs which have to be experienced to be believed. The vegetation, typical of slopes in Eastern Ghats and the great Casuarina atmosphere, makes this beach, a one of a kind experience. The nearby delta, where the mighty Subarnarekha merges into the Bay of Bengal, is an additional attraction. The Marine Aquarium and Research Centre (MARC) was established in the year 1989 during the Seventh Five Year Plan. The major objective of the Centre is to display the marine biodiversity of the region and impart its values to the common people and to carryout the research activities. MARC has largest inbuilt marine aquarium in the country and equipped with sea water circulation system and advanced filtration unit. The aquarium has 24 big sized (15x10x10’) marine tanks and 8 fresh water (3x2x2’) tanks which are equipped with compressed air supply, light and regulated supply of inflow & outflow of water.Hundreds of visitors make it a point to view the Aquarium every day. The aquarium is opened to public on all working days from 9.3 0 A.M. to 6 P. M.
Lord Shiva Temple At Chandaneswar:Only 8 km away from Digha the century old Temple of Lord Shiva at Chandaneswar,near Bengal and Orissa Border.Nearly half million people & pilgrims visit the temple at Maha Vishuva Sankranti or Gajan Mela : towards the end of Chaitra. Shankarpur: Also known as virgin beach, only 14 km east of Digha. It is also a regular fishing harbour. This beach is mostly empty except on weekends. The mornings are cool, when fishermen can be seen hauling their huge nets out of the sea. The morning sun reflecting on the sea waves in the east, and the local fish-boats on the coast offer excellent photographic opportunities. Subarnarekha River: The salty place where Subarnarekha River draining into Bay of Bengal, only 12 km away from Digha, located in Orissa-Bengal border. This is a new destination for Digha tourists. Tajpur: Tajpur is also a very upcoming destination located very close to Digha with the Government promoting the place with Water Sports facilities. Hotel Tulip is a fine option to stay in Digha, which is a peaceful retreat that is fully furnished and well equipped with modern facilities. 10% Service Charge on tariff. 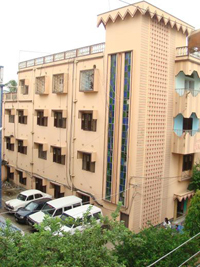 Hotel Duke is located at Rajbari Complex, P.O - Old Digha. All rooms are well furnished with modern furniture bedding and bathroom fittings. 24 hours running water. Car parking facilities available. 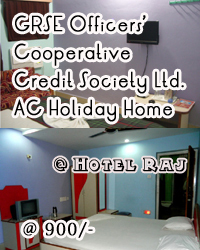 Here AC and Non AC rooms are available at moderate rates. 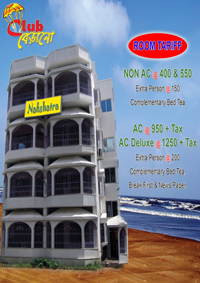 Hotel Nakshatra is a budget hotel at New Digha which is very close to Yuba Abas. The Hotel is fully furnished and well equipped with modern facilities. 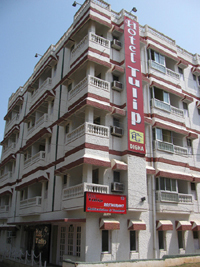 Hotel Greenland Inn The hotel provides accommodation in 17 well-furnished rooms divided into 6 categories, namely. Double Bedroom (AC & non-AC), Deluxe (AC & non-AC) and Super Deluxe (AC & non-AC). All rooms are elegantly appointed, and equipped with comfortable beds and contemporary amenities. Hotel Nandan is situated at the heart of Old-Digha Town on Main road SEA-BEACH two minutes walking distance.